The ABC's of Eating with the F&G. 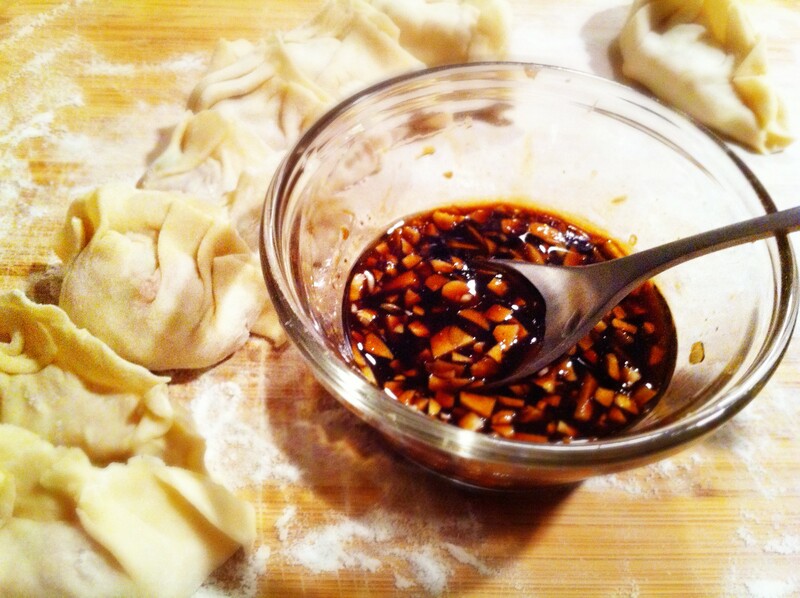 Remember the delicious Homemade Chinese Dumplings we made!? We were so excited about our final product that we cooked them TWO separate ways in one meal. 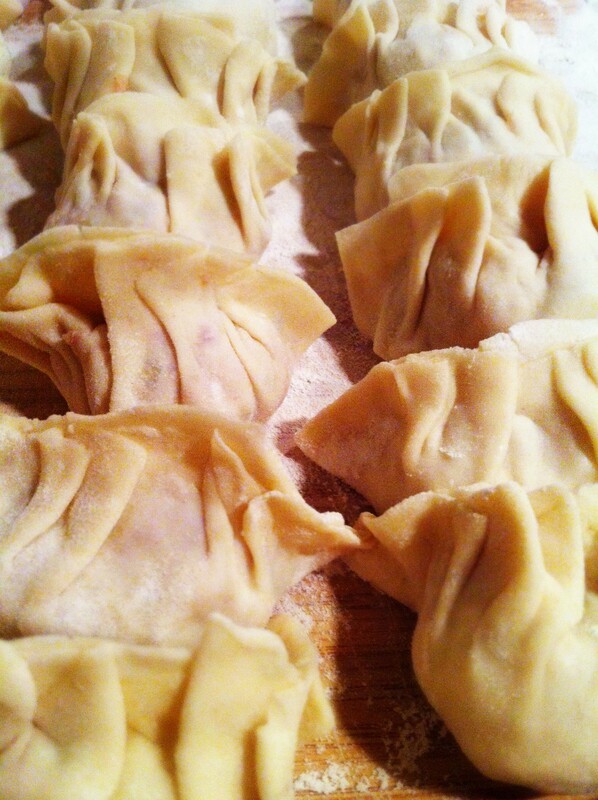 First, we pan-fried the dumplings to make delicious pot-stickers. And second, rather than boiling them and eating them straight, we cooked them in a home-made broth and made a dumpling soup. The crisp Fall weather is here so it’s about the right time to for some soup dishes. Don’t underestimate this clear broth base, the ginger in this soup brings an additional layer of warming sensations and it is unexpectedly flavorful and comforting. And believe it or not, it’s probably pretty good for you too! 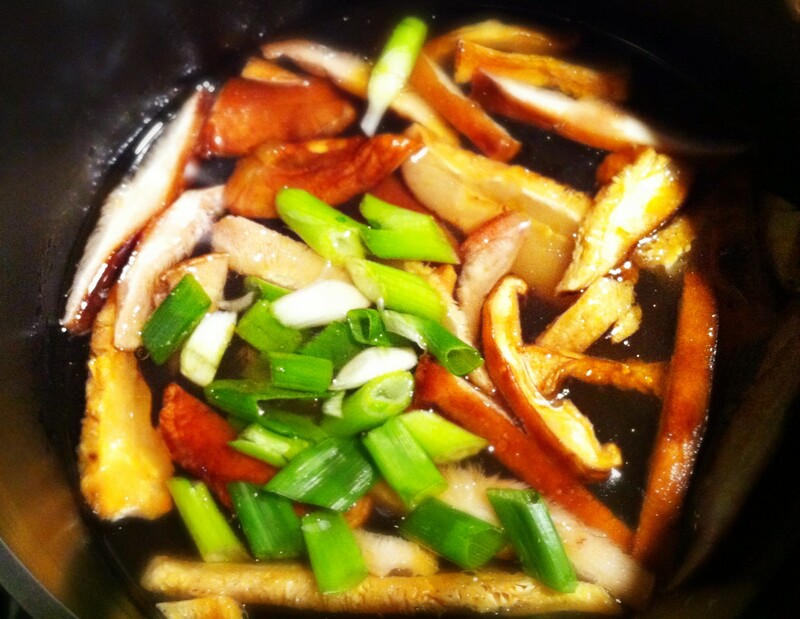 Put the chicken broth, ginger, mushroom, soy sauce, cooking wine, vinegar and sesame oil into a soup pot and bring to a boil over high heat. 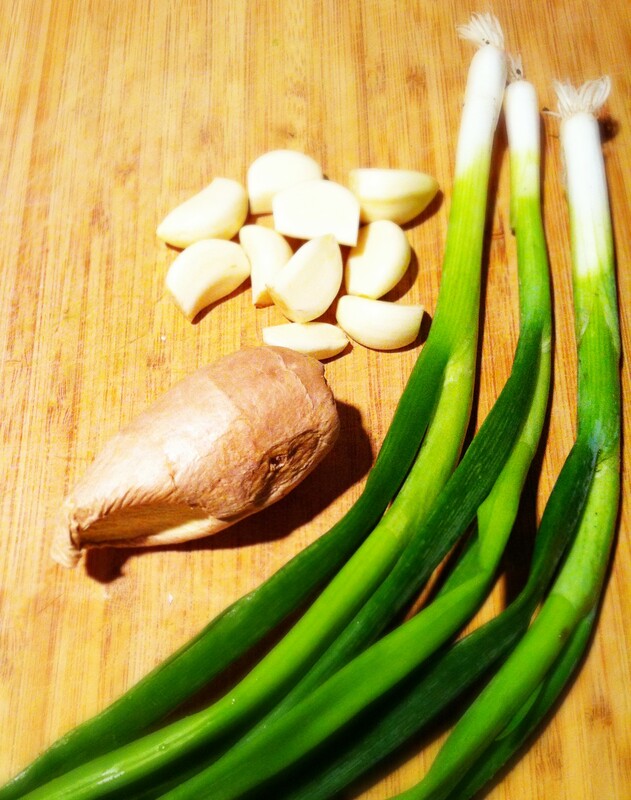 Add the spring onions and adjust the heat so the broth simmers, about 10 to 15 minutes. Slowly add the dumplings into the broth, give a little stir so the dumplings don’t stick together. Cook for about 3 minutes. When the dumplings float up to the surface, cook for another 6 minutes. They are done when the skin in translucent. Divide among warm bowls and serve. We made 6 dumpling per serving as a side dish but you’re more than welcome to add more dumplings and turn it into a main dish. We also were running low on vegetables when we made it, but this broth goes well with almost all vegetables, such as napa cabbage, broccoli, spinach, snow peas…. you name it. Throw in some greens right before you drop in the dumplings, it’ll only make the soup healthier, and of course, better tasting!!! Just another beautiful Sunday afternoon and we are sitting in the apartment with nothing planned… such a luxury to have some relaxing time like this after a busy week of work. We randomly watched a video clip my mother sent me, a video introducing traditional Chinese food and the making of some famous dishes. As we watch them make all the doughy delicacies with all different kinds of fillings, we started to crave something similar. We want to make some dough, too!! We didn’t even finish the clip before we decided to take the challenge and make some Chinese dumplings for dinner, from scratch! 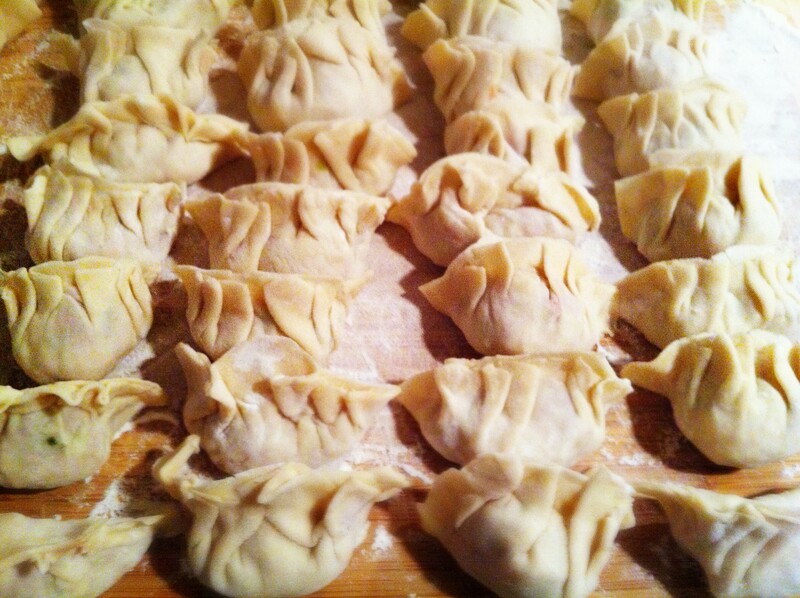 I remember making dumplings with my aunties and grandma in Taiwan when I was still a little kid. The adults would prepare the meat filling and dough wrappers and I would help filling, pinching and, of course, eating! It was easy, fun, and satisfying! Well, nobody is around to prepare the fillings and wrappers for me but I crave for that old experience, so I am stepping up to recreate this fun and delicious recipe. Base on some memories and some research, this is our Eat.F.G. recipe. 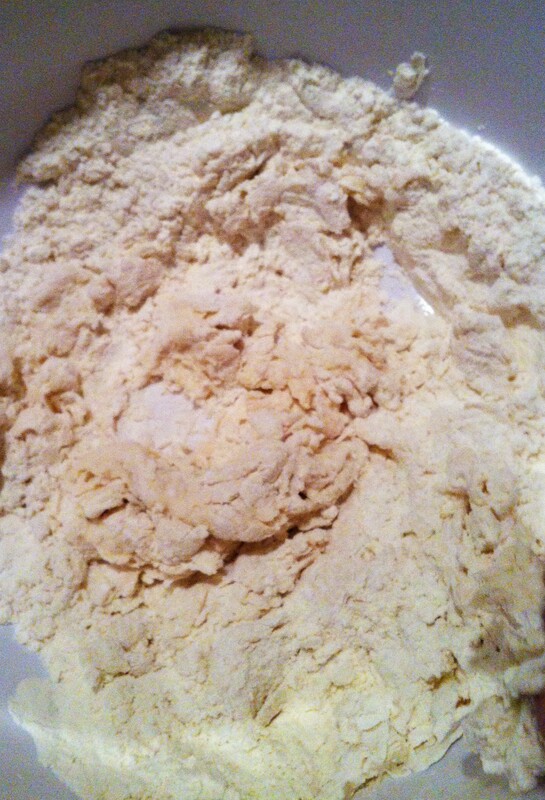 To make the dumpling wrappers: put the flour in a mixing bowl, add 1/2 cup of water and a pinch of salt into the flour. Slowly mix it with your hands, add the remaining water if it gets too dry. Knead the mixture until it forms a soft dough, place the dough on a lightly floured counter and knead nut ill smooth. Set the dough on the side and let it stand for 10 minutes, (perfect time to prep the filling here). 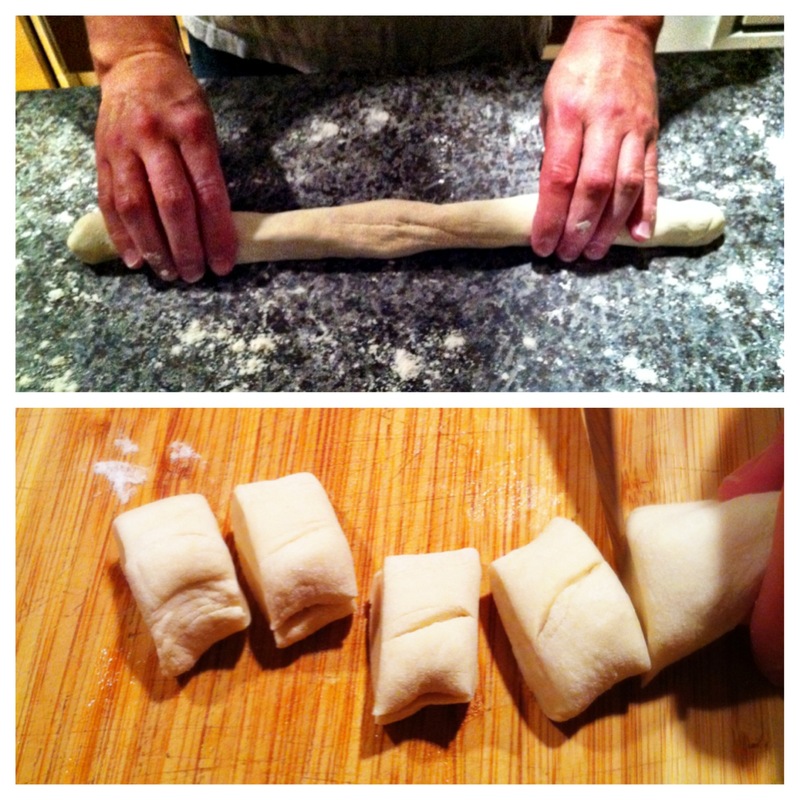 Roll the dough into a long baton-like roll and cut it into 40 small pieces. Use a rolling pin to roll each piece to a thin circle, about 3 to 4 inches in diameter. To make the filling: finely chop the cabbage into very small pieces, sprinkle the 1 tsp salt and mix well to dehydrate the cabbage. Give it a few minutes and then squeeze out the excess water (it should look like the picture below). 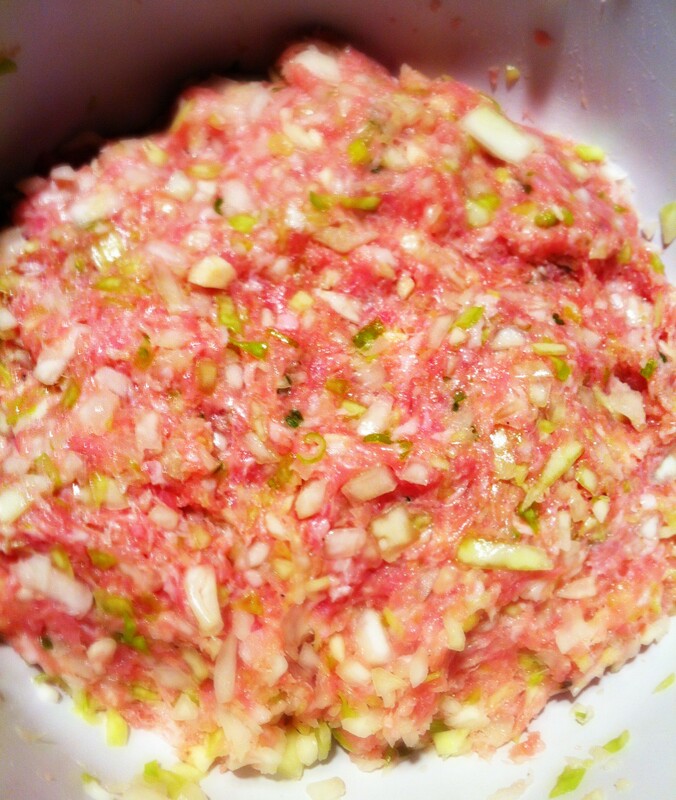 Combine the cabbage with ground pork, green onion and the rest of the seasoning and mix well. 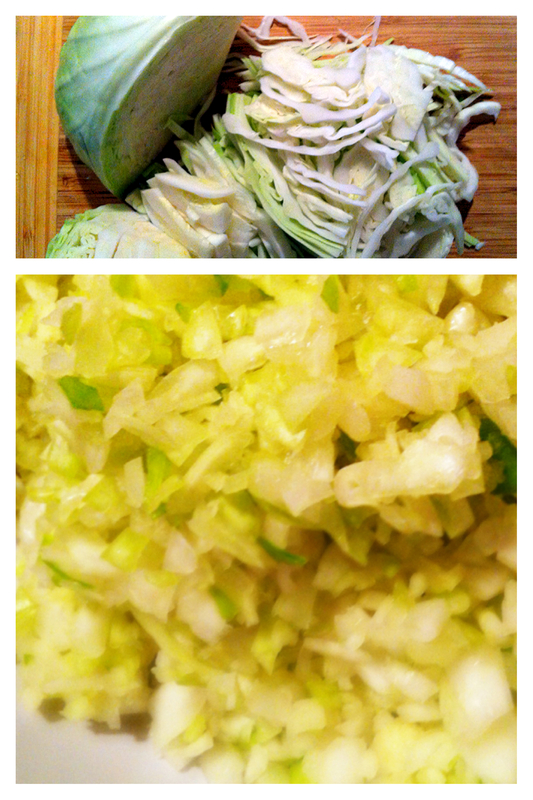 Fresh cabbage, finely chopped and squeezed!! Filling with all ingredients mixed in. 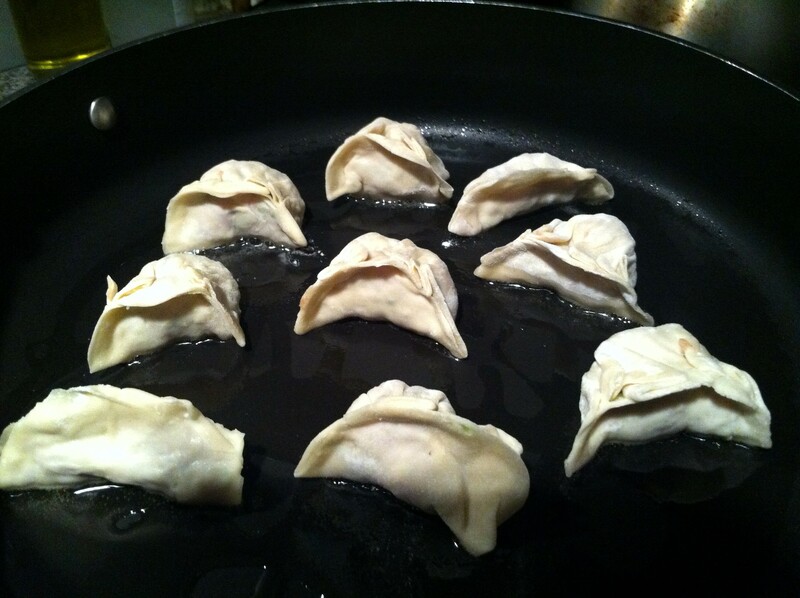 To make the dumplings: get a small dish with water. Place about a tablespoonful of filling in the center of a dough circle. Dip your finger in the water and moist the edge of the dough, fold the circle in half, and use index finger and thumb to pinch the edges of the dough on one side of the dumpling into “pleats”, pressing each pleat against the flat side of the dough to seal the dumpling as you go. I usually start from the center to the corner and make about 3 pleats on each side, but any direction would work. Firmly pressed the pleaded side of the of the wrapper against the flat side and make sure the dumpling is completely sealed (we don’t want the dumpling to burst open or have any leakage during cooking). 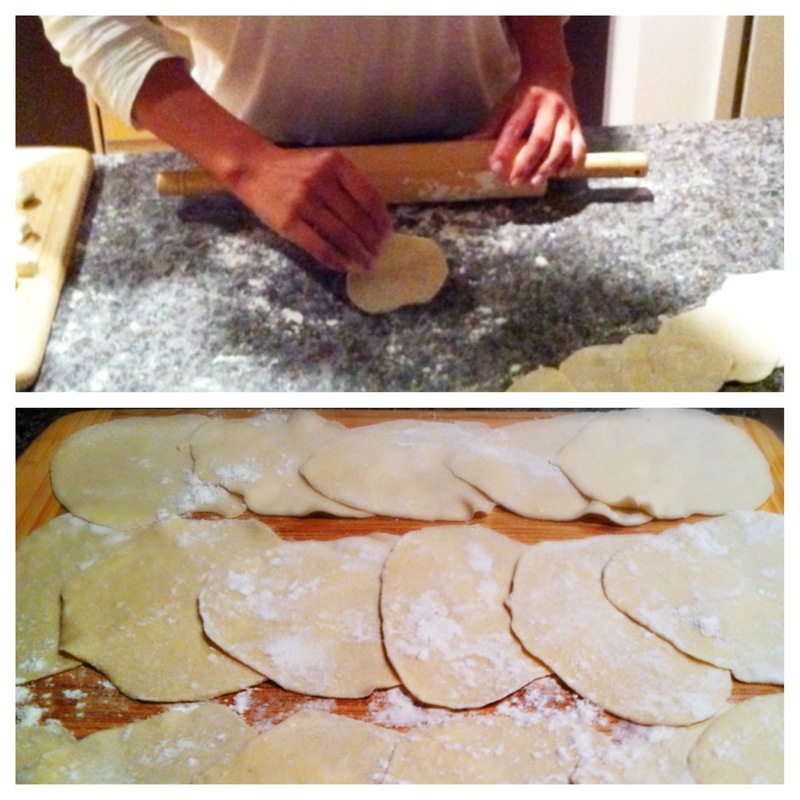 Line up the finished dumplings on a floured surface to prevent them from sticking together. There are so many ways to cook the dumplings. Most of the time they are either steamed, boiled or pan fried. 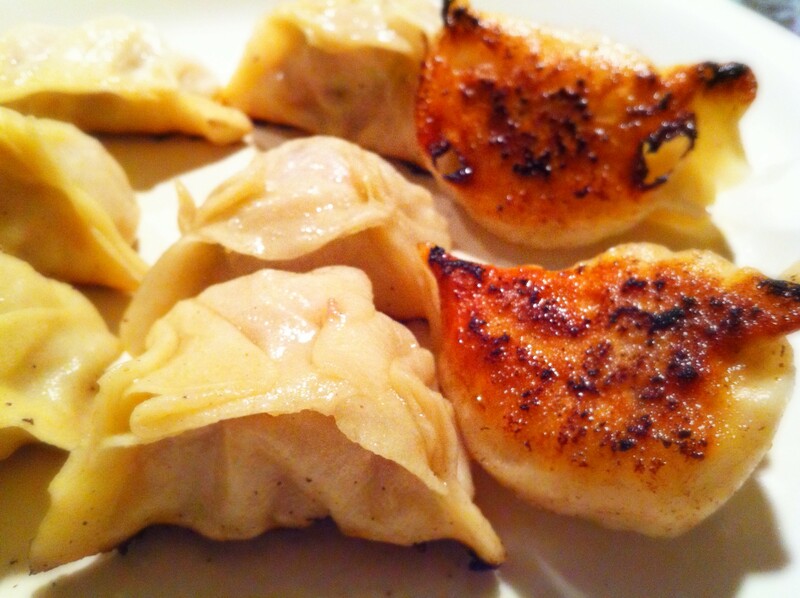 Pan fried dumplings are also known as pot stickers, it is definitely the most popular kind. Tonight, we are having dumplings, TWO ways!! For the first kind, we’ve decided to make some pot stickers, and for the second kind, instead of boiling the dumplings in plain water, we are making some Chinese Dumpling Soup as we like to take things to the next level! 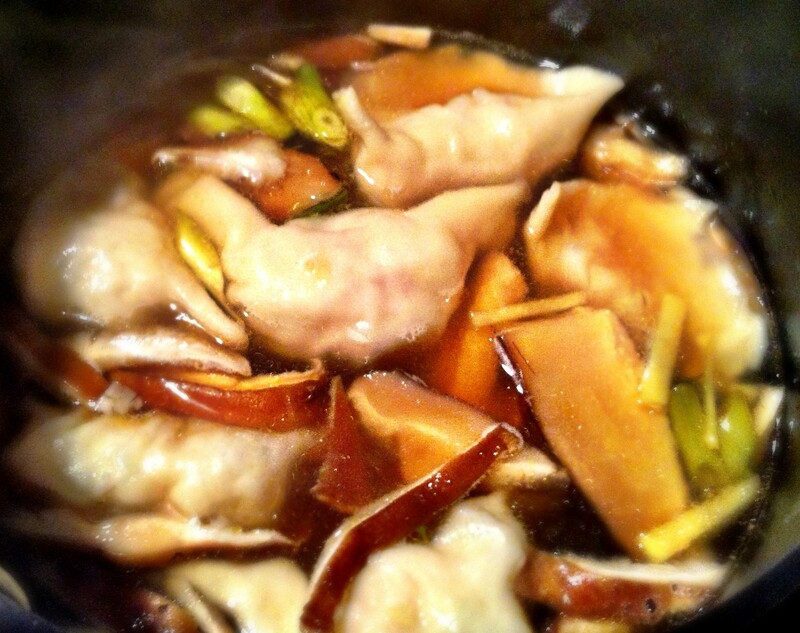 To make the pot stickers, drizzle about 1 tb oil in a pan and heat it up. Place the desired amount of dumplings flat-side-down in the pan, turn the heat low and fry the dumplings for about a minute, or until golden brown. Add 1/2 a cup of hot water and cover, let it steam for about 6 minutes or until all water has evaporated. Remove the dumplings, now pot stickers, serve hot with dipping sauce! Dumplings sitting flat-side-down in the hot pan! I know it looks very complicated with the long lists of ingredients and instructions, but it really is not hard. The first few dumplings we made looked a bit funny, but they soon started to look better and almost professional as we got into the rhythm. I must say it is VERY rewarding when we finished and had a whole army of fresh dumplings lined up in front of us. All we needed to do was to decide which way to cook them so we could eat them all up. The dumplings store very well too if you’er not planning on eating all of them immediately. 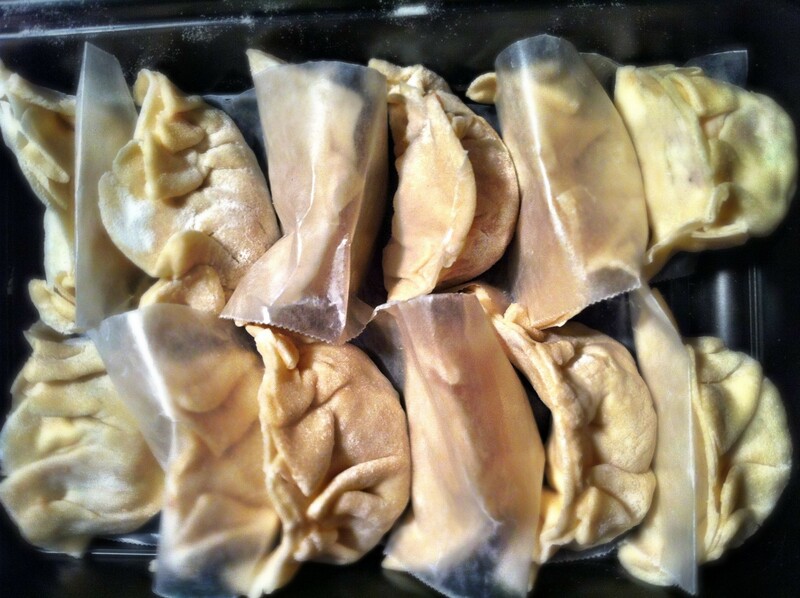 Just separate the dumplings with wax paper so they don’t stick together in the container and tuck it in the freezer. The dumplings should store up to a month or so. That’s the project of our Sunday, and I’m pretty proud of our end product. And I am also very happy to announce that after all these years, the experience of making dumpling remains the same: it’s easy, fun and very satisfying!